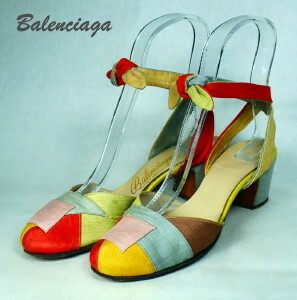 1940's vintage BALENCIAGA ankle strap sandal pumps. Multicolor linen. Applied patchwork vamp. Round closed toe. Red and celadon wrap around tie ankle strap with light blue facing. Light blue Cuban heel. Beige leather liners. The CUTEST!!... PLUS they're BALENCIAGA! Width, measured outside at widest - 3"
Excellent condition and fine construction. Shows some general soil and age discolor throughout. Fabric strong... shoes totally wearable.